We decided to take advantage of Colorado living and headed out to ski this weekend. We have season passes for Keystone and A-Basin, since they are both drivable for day trips, and they seemed like a good place to teach F&B to ski. That was Saturday. Sunday, we were tired, cold, and it started to snow, so Monday lunches were made from what was in the fridge. However, grocery shopping is imperative, so that's where we are going after school. Faith had a cream cheese and jelly sandwich on goldfish bread, complete with a sugar eye. 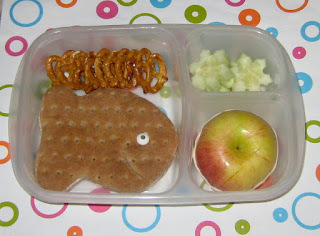 To go with it, she had some pretzels, some cucumber snowflakes and an apple. Have you seen the puzzle apple on Pinterest yet? Cut it, piece it back together, rubber band it, and it will keep without browning! Perfect for the kids lunches. It's packed in our Easy Lunchboxes (also available on Amazon), as it was the only container I could smush the apple into. I wish I could take credit, but I saw it on Pinterest. I'm just happy it worked. Both mine love apples, but not dipped in Sprite/juice to keep them fresh.